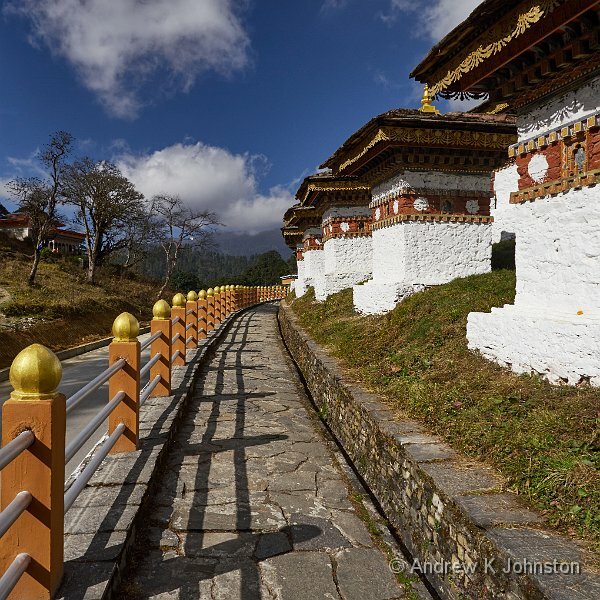 We leave Thimphu via a small mountain road which climbs rapidly our of the city towards the north-east. We are treated to great views of the Buddha, which although below the summit is brilliantly positioned and visible from all over the valley. The drive up to the Drochula Pass is pretty, but quite hair raising. Apart from hugging the side of a steep valley, the Bhutanese seem to have decided to simultaneously rebuild most of the length of most of their roads, which means near constant construction conditions. The Drochula Pass is at 3050m, or about 10,000′, and is home to the prettiest temple yet, brand new in 2003, a field of 108 stupas, and yet more acres of prayer flags. It’s being developed both because of its position on the road to Punakha, but also in commemoration of a short war in which India and Bhutan were allied to drive out some terrorists hiding in southern Bhutan. It turns out the drive up to the pass is nothing compared to the drive down, which takes over two hours on almost completely unsurfaced roads. However we do get a couple of good photo opportunities, and lunch near the bottom at the Divine Cafe is both delicious and very welcome. In the afternoon we trek over to the Chime Lhakhang. This means “no dog temple” which is singularly inappropriate since like most other locations in Bhutan there are vast numbers of mutts roaming about. The founder of the temple was Lam Drukpa Kuenley , my kind of Buddhist, fond of wine, women, song and meat! Given that one of the other areas in which Lam Drukpa Kuenley exceeded normal clerical expectations was in siring children, the temple has a reputation for enabling fertility, and the people of Punakha have an obsession with, shall I say, knobs. There are phalli everywhere, painted by every door, welcoming you to the cafes. Obsession doesn’t quite cover it. The base of the Punakha Valley is at about 4,000′, and it’s warm enough that the jacket I have worn elsewhere is too warm, and I’m fine in just a T-shirt. Not bad for the Himalayan foothills in November.